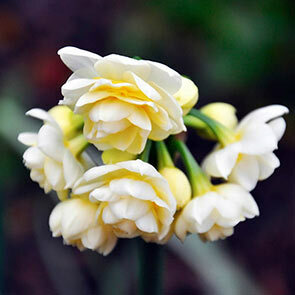 Add alluring scents and delightful double Summer Cheer daffodil blooms throughout your landscape. Blooming in the early summer, these deer-resistant Dutch perennials feature pearly white petals with traces of pale yellow. 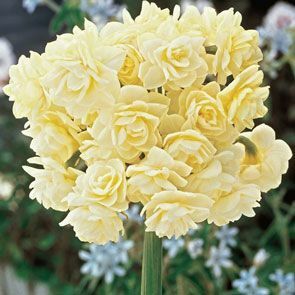 With long-lasting blooms and heights that reach 10 to 12 inches tall, these daffodils make a splendid addition to cutting gardens for graceful cut flower arrangements. Add these hardy daffodils to containers for stunning accents to your front porch. Plant your Dutch daffodils (Narcissus 'Erlicheer') in the fall in areas of the lawn where they'll receive full to partial sun. Ensure that you place your daffodil bulbs 6 inches deep into the soil and approximately 4 to 6 inches apart for the best results. These enchanting daffodils require well-drained soil, but can also tolerate clay, loamy and sandy soil and flourish in climate hardiness zones 4 to 9. Create a sensational display by planting your Summer Cheer daffodils in clusters in sunny meadows, allowing them to naturalize. You can also plant these beauties in colourful cottage gardens with tulips, peonies, hollyhocks and coneflowers. Add colour and elegance to your landscape by planting your daffodil bulbs along walkways and paths or plant them in between shrubs and hedges. Breathe in the sweet scents of lovely Summer Cheer daffodils. For daffodil lovers who don't want to wait. Foliage Type Long, narrow gray-green leaves.